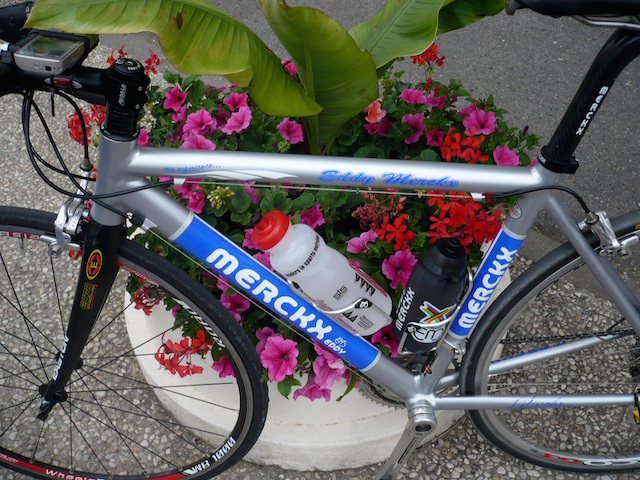 it's a bit of a mouthful for the name of a bike, and perhaps merckx would be better providing their aluminium bikes with letters the way they do with the carbon frames. perhaps the alx sloping would be a fine name to apply? anyway, this was undoubtedly the most unusual test i have ever conducted due to the nature of the beast. 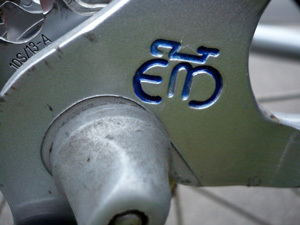 for the second year in a row, i was offered an eddy merckx bicycle on which to ride the 600km of london-paris, which pretty much sorts two problems at once; firstly it obviates the not inconsiderable problem of trying to transport a bicycle from the island of islay down to the great metropolis, and secondly it provides a different, and perhaps more exotic environment in which to road test a bicycle. and at the risk of over egging the pudding, this test was completely wrong from the start. by way of explanation, let me state that this frame was exactly the opposite of anything i would have chosen for myself: it was all aluminium, steeply sloping top tube and as compact as they come. the sort of thing i would have walked right past in a cycle store. fearless or what? so what do we get for our money? the merckx alloy sloping is constructed from easton race 7005 tubing, with standard rear stays, and an integrated headset (that's another bit i would avoid if possible). sizing is a tad on the confusing side (or at least, it is for me). i ride a 54cm traditional framed bicycle which almost translated to a 45cm merckx racing; the numbers on the merckx website shows this as a 51.5cm. now bear in mind that all the initial negotiations for the provision of this bicycle were made by e-mail - i didn't actually see it until we met at imber court in london (a few people mentioned that i was brave undertaking london-paris on a bicycle i'd never seen before, but i have faith in my mechanic), and the top tube shows up as 53.5cm. as a being with fairly long arms, i usually ride 55cm top tube with a 130mm stem. surely this bicycle was going to be way too small? possibly using the same technology as dr who's tardis, this apparently tiny bike fitted just fine thank you very much. granted there was a lot more merckx carbon seatpost showing than i'm used to, but a quick spin round the car park before the off didn't show up any major inconsistencies. as befitting his new campagnolo service status, graeme had outfitted the merckx with a centaur groupset, with alloy ultra torque chainset (deviation being the chorus integrated headset), vista magic pedals, modolo kx full carbon bars fitted into an aluminium x-tra oversize stem which steered a pair of easton ec70 carbon forks. 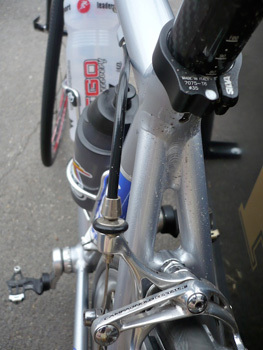 here was possibly the only evidence of the sizing issues, the gap between headtube and stem had seven spacers. not that these were evident from the cockpit. 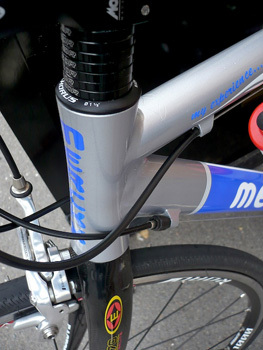 the modolo bars were happily similar to the alloy version employed on last year's cxm test bike; non-anatomic but with a pleasant curve from flats to the end. the tops were slightly flattened, though not as much as some. i confess myself to be a mite confused as to what was wrong with the good old traditional curve in the first place, but that's progress. in use, the kx carbons were just dinky doo. if i have one criticism, it's the my experience legend on the top tube; i understand what eddy's getting at here, but it seems just a little bit twee. just plopping his signature, a la ernesto would have sufficed. london-paris is billed as the professional event for amateurs; it gives entrants the opportunity to ride their bikes with fully closed roads in france, a lead car in each group and full technical support. if you puncture, somebody leaps out of the van and changes the wheel. this year i had a a bit of frosting on the support cake - i had the option of two sets of wheels: a pair of wheelsbike 3000 full carbons fitted with tufo tubulars (ironically, considering who was riding them, these were my fast wheels). for slower days (!) i had a wheelsbike 1000 up front, and a camapgnolo scirocco on the rear. heaven knows what the tyres were; each wheel was different. the wheelsbike carbons were fitted on day one, and i thankfully found out at close of play that, since the cork pads hadn't fitted the centaur brakes, i had ridden about 180km with standard pads on carbon rims. not fun. the wheels and tubs themselves were fabulous, but the braking was very scary, switching between either off, or on. in the latter position both wheels locked up, and did so very easily. thankfully there wasn't even a hint of rain. after frightening myself to death with the wheels, standing up to climb brought scare number two, because the smaller frame was incredibly accurate - the early climbs were a bit wobbly, but by day two, bike and rider were shifting up hills at an impressive rate and with demonstrable stability. and braking had improved dramatically with the replacement of the carbon wheels, though the latter did look far more impressive. aluminium has a reputation for uncompromising stiffness - it's why most manufacturers fit a carbon rear end to take out the sting, but we traversed not only a seemingly never ending number of railway crossings, but also the 1.5km stretch of paris roubaix cobbles at mont cassel. i did wonder about the integrity of the headset about half-way across the cobbles (false alarm i'm happy to say), but i can honestly say that the merckx felt as comfortable as could be expected while bumping across the pave. possibly more so. and throughout the 600km, there was nary a feeling of discomfort or fatigue, a major surprise to me, considering the compact nature of the frame. acceleration on both the flat and on the hills was impressive; downhills i cannot realistically comment on, given that i am particularly crap at riding same. admittedly it held its line well without any undue effort, but cornering was where i felt the bike let itself down. i will readily admit that i am hardly the best judge of racing line, but similarly to last year's cxm, i feel that the merckx racing has a tendency to understeer; not drastically, and certainly less so when you are aware of, and get used to it. i'd be happy to think of it as a feature, not a bug, and i may have been royally spoilt by my regular choice of bicycle - the fact that i have experienced the same on two bicycles from the same stable would seem to mark it out as an inherent factor. i'm not criticising, just letting you know it's there. the very fact that someone of my limited abilities can ride a bike sight unseen, from london to paris, and wake up on day four without so much as a twinge, points to both a very well designed bicycle and a highly competent mechanic. 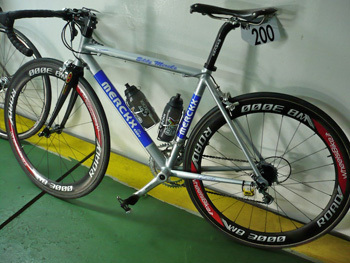 i'll be considerably less inclined to ignore a compact aluminium frame in the future, particularly if the name merckx is written on the down tube. the merckx racing frame and easton carbon retail at £880 ($1750) with the campag finishing kit as fitted, modolo bars and stem, and a pair of campag scirocco wheels you'd expect to pay £2250 ($4470). the wheelsbike wb3000 carbons retail at £1350 ($2680); modolo kx full carbon bar £180 ($357) and the modolo x-tra stem £39.95 ($80). i am extremely indebted to graeme freestone king of fkm marketing, uk merckx importers for not only supplying the bicycle and wheels, but for setting up the bicycle so precisely, that i didn't have to so much as adjust the seatpost from start to finish. that's skill.